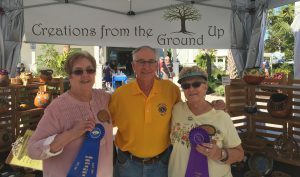 The Sanibel Captiva Lions Club announces the winning artists of the 35thAnnual Arts & Crafts Fair. Works are judged by three artists from the Sanibel Captiva Art League, who look for original creations in three categories – Two-Dimensional Art, Three-Dimensional Art and Creative Crafts. Linda Huppert was named Best in Show and took first place in the Creative Crafts category. The Creative Crafts category was rounded out by Gisela Damandi, second place, and Arlyne and Richard Julao, third place. Geoff Coe earned first place in Two-Dimensional Art with AJ and Jack Ferrel taking second place and Anne Schroeder in third. First place in Three-Dimensional Art went to Maureen Compagnoni with Walter Harper earning second and Leo and Karin Villaroman in third. Works are judged by four photos submitted by the artists with their application and a visit from the judges on the first day of the fair. Work must be original, made with quality and appear to be done by the artist or artists. It also must be handmade, which primarily applies to jewelry and creative crafts. “The idea is to identify items that are truly creations of the artist and not a mass produced item or simply a re-seller of merchandise,” explained Sartoris. The Lions Arts & Crafts Fair is the club’s biggest fundraiser of the year and benefits various Sanibel charities, vision and hearing based charities and local scholarships. It features more than 100 artists on the grounds of the Sanibel Community House and a wonderful selection of raffle and silent auction items inside. 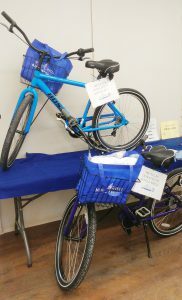 Donors include: Sanybel’s Finest, Lily & Co. Jewelers, Spatini, Pecking Order, Cip’s Place, Traders 2, The Sandbar, Eileen Fisher, Sanibel Wellness, Bleu Rendezvous, Great White Grill, Traders, Forever Green – Ace Hardware, Jerry’s Foods, Crackerbox, and Beachview Tennis Club. “This year’s fair was a tremendous success,” said Lion Tom Nachazel, club president. It takes one year of planning and more than 50 Lion volunteers to produce the fair each year. “We couldn’t do it without the support of residents, businesses, City of Sanibel and Sanibel Police Department,” said Nachazel. The Sanibel Captiva Lions have dinner meetings on the first and third Wednesday of each month at the Sanibel Community House. Visiting Lions are welcome. Anyone interested in joining should contact membership chairman Lion Steve Schulz at stevenschulz@comcast.netor 239-233-6261.